This is an attractive perennial, Dianthus gratianopolitanus is evergreen and with its attractive rose pink flowers is a must for the cottage garden. Attractive green to grey foliage with the flowers rising above an taller stems. The plant will only reach around 30 cm in height and form a clump over time. The flowers are best described as soft and slightly fringed, five single petals and with good fragrance. This is a variety that will self sow in the garden, not invasive and a very useful cottage garden plant if you can find it for sale. 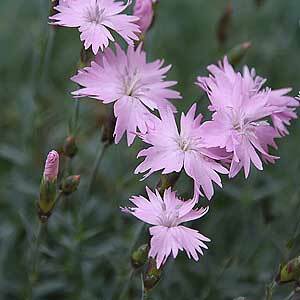 Dianthus gratianopolitanus are best grown in full sun, planted in a humus rich well drained soil. Although they cope with a range of soil conditions, they do require good drainage to prevent root problems. Fertilise the plant each spring with a general purpose slow release fertiliser. Alternatively use some well rotted compost and aged cow manure, just before you mulch. At the end of winter of beginning of spring, prune back to just above the lowest foliage to create a good bushy habit. Propagation is from seeds or easy from cuttings, see the video on how to propagate Dianthus and Carnations from seed for full information.